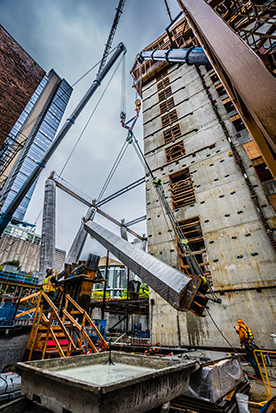 Omega Morgan Crane Service Inc and Apex Steel Inc were tasked with setting the foundation using a single crane and creative rigging with the help of rental equipment specialists, Lifting Gear Hire. For crane superintendent Eldon Ash and senior engineer Kai Farrar of Omega Morgan Crane Services Inc. and owner Kevin Koester of Apex Steel Inc along with engineer Ron Roberts, the engineering of the structural columns supporting the proposed 38-story office complex provided a challenge in ensuring the y-shaped columns could distribute the weight of every floor above evenly among the foundation while maintaining a 72-degree angle of installation. More than a year of planning, engineering, testing and simulations went into the design of the project, dubbed 2+U (2 and U for its location on 2nd Avenue and University Street) before ground was broken on site.